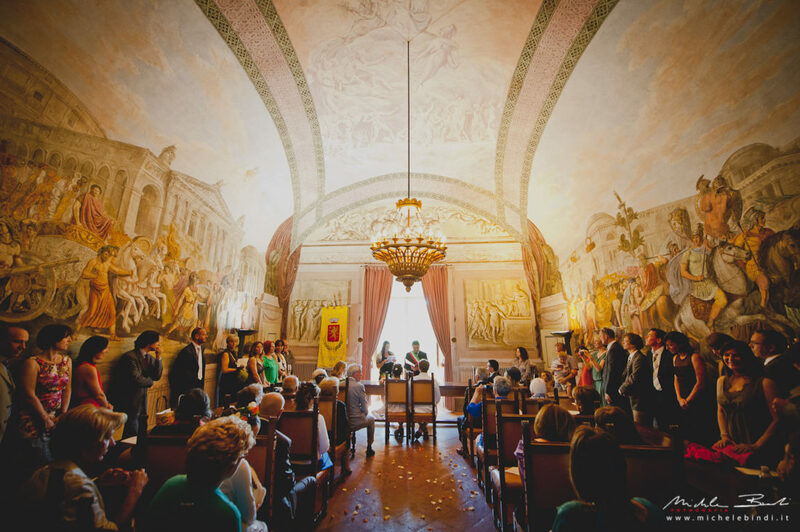 There are literally dozens of locations in Tuscany for you to choose from for the special venue for your civil wedding in Italy; however, at BeA Alfresco Wedding we have a favorite – the town hall in Lucignano in the province of Arezzo, which is located only 30 minutes from Siena. Lucignano, a charming fortified town which still retains its well preserved city walls, is a unique example of early medieval urban planning with its concentric circles of streets surrounding the castle which was completed in the 16th century and sits at the highest point of the town. The town hall with its exceptional architecture is situated in the upper part of Lucignano, where the rich residents used to live (on the upper slopes of the hill – while the poorer people had to build their homes at the bottom). The hall, or Palazzo Pretorio, is rich with frescoes, and contains the town museum, or Museo Civico, on the ground floor. The museum features the famous Golden Tree, or Tree of Life (L’albero della vita), which is a 14th century reliquary from the church of St. Francis. A beautiful artifact, this jeweled and gilded tree is said to bring good luck and a lifetime of prosperity to a couple when the groom makes a proposal of eternal love in front of the tree and both groom and bride turn around before it. Lucignano Town Hall has the perfect romantic setting in its beautifully restored wedding hall, and overlooks a small, quiet square where toasts can be made after the ceremony. Your civil ceremony will last for around forty minutes and can be accompanied by a number of musicians. We recommend this particular town hall because it is the perfect size for small weddings of around fifty people, and from where you and your bridal party can walk or ride through the narrow streets of the town to the reception – to the accompaniment of shouts of “Auguri!” from the locals – which can only add to the joy and romance on the occasion of your civil wedding in Italy at the Lucignano town hall in beautiful Tuscany.